There were two Falmouth Packet named Anna Teresa, in the service during the late C18. Captain Edward Lawrance [*] was appointed to command a packet named Anna Teresa, on May 19th 1769, this must have been the first so-named vessel. The custom was that the commander would purchase the ‘top’ of his new command – that is to say the rigging sails and furniture – if not the whole vessel. Assuming that he bought the whole, within a couple of years he decided to replace her, having a new hardwood packet of the same name built in her stead. The older Anna Teresa would have continued in the service while the new was being built, but Captain Lawrance probably remained ashore to supervise the new build with an acting commander taking his packet to sea in the interim. A few months would have been required for finishing and fitting out the new packet, and she appears to have sailed on her maiden voyage, to the West Indies, on the 12th July 1773. Lately employed as a Packet on the West India station, built at Philadelphia, burthen 180 tons, more or less, two decks, bottom sheathed, with all her masts, yards, cables, anchors, sails, standing and running rigging, as she came from sea. The above ship may be viewed by applying to Mr. Richard Simmons, ship-builder, at Little Falmouth, where she now lies; and of whom inventories may be had; and also of Mr. Allison, bookseller, printer, and stationer, in Falmouth. Friday arrived a Mail from the West-Indies, brought by the Anna Theresa packet boat, Capt. Lawrence, to Falmouth. The arrival of international mails at the General Post Office, was more widely published in the provincial newspapers, than the dispatching and sailing thereof, though a significant number of these did not pass without attention from time to time. The twice weekly shipping newspaper Lloyd’s List, was generally the most accurate in reporting the sailing, arrivals¸ and movements of the packets themselves, though it frequently omitted to mention the names of their respective commanders. The Anna-Teresa Pqt. Arriv’d at Jamaica the 28th of April, and was to Sail the 11th of May for England. The Anna Teresa Pqt. Boat, Lawrence, from the West Indies, Arriv’d at Falmouth. 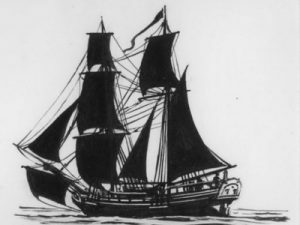 Between July 1773 and April 1776, the Anna Teresa completed five West India voyages, notionally under Edward Lawrance’s command. We do not know whether he sailed in command on every voyage as packet captains frequently staying on shore for voyages in that era. Edward Lawrance’s Journal commenced at the outset of the packet’s sixth West India voyage from Falmouth. Sailing on June 9th 1776, it records his personal observations on what was to prove his final voyage. The journal terminates abruptly with Edward’s entry for August 6th. It subsequently transpired that he died of an unknown cause, in St. Vincent, on August 10th. Her sailing master (Gayland) appears to have brought the packet home. The Anna Teresa packet, for New York, and Antelope, for Jamaica, which sailed from Falmouth the 15th ult. were intercepted by a French frigate of 38 guns, twenty leagues to the westward of Scilly; and after a chace of six hours, the former was unfortunately taken, and carried into L’Orient. The mail was thrown overboard, but not sinking immediately, it was afterwards taken up by three French sailors in the boat; the captain saw it lay on the deck of the frigate as soon as he was put on board. These dispatches are said to contain the plan for the ensuing campaign in America, and other intelligence of the greatest consequence to our enemies. The Jamaica packet escaped by dint of sailing. Thus the Anna Teresa left the Falmouth Packet Service, and disappeared from the packet records.